Endeavor Exteriors is a forward-thinking exterior restoration contractor serving the Denver area. Similar to HOVER, the company is built around the mission to innovate the exterior remodeling industry. Eager to learn how they are working toward this ambitious goal, we reached out to Chris Falasco, Founder and CEO of Endeavor Exteriors, and Jonathan Baurer, Director of Digital Strategy. 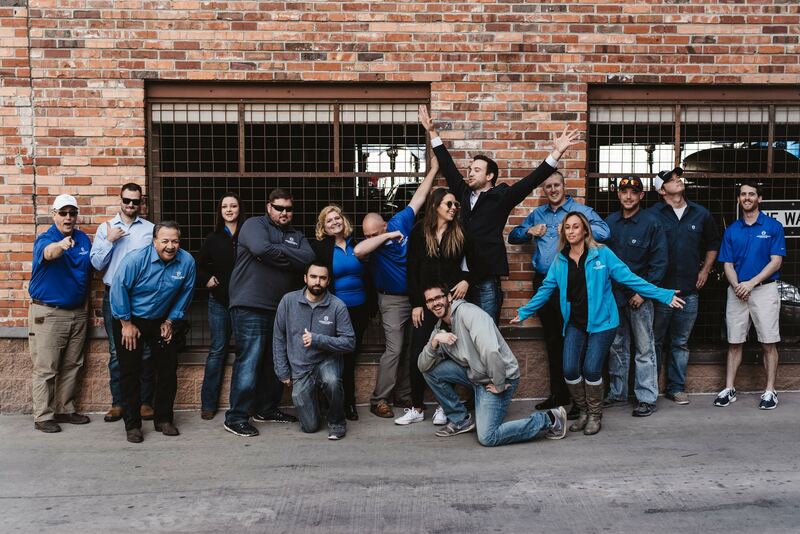 Chris founded Endeavor Exteriors when he realized that although the Denver market is flooded with exterior contractors, no company was excelling in customer service. Therefore, he decided to take the opportunity to change the exterior restoration industry for the better by putting the customer first and focusing on providing the best-in-class service to homeowners. To reach this objective, Endeavor Exteriors has adopted the best technologies available within the construction industry. Endeavor Exteriors built its digital sales process, named the Endeavor Experience, in such way that would provide homeowners with the information they need throughout their project while respecting their busy lifestyles. When a lead comes in, the appointed salesperson invites the homeowner to capture a couple of photos of their house with the HOVER app. As soon as the 3D model is ready (typically within 2 to 4 hours), the sales representative schedules a virtual consultation with the homeowner to review the 3D model and walk through the design options for the project. At this point, the homeowner also learns about the ins and outs of Endeavor Exteriors’ working process and has the chance to ask questions. After this call, the homeowner is fully equipped to use HOVER’s 3D model of their actual home to experiment with different designs on their own time. “With HOVER, we can provide homeowners with everything they need to be in control of their remodeling project and confidently make decisions. The homeowner knows exactly what to expect from the very start – both in terms of our process as well as the desired end result. HOVER brings a level of transparency to exterior remodeling that homeowners had previously been missing. Of course, our team of professionals are happy to assist the homeowner along the way,” states Chris. Once the homeowner has selected their preferred materials, Endeavor Exteriors ships product samples to them. Jonathan explains, “we’re mirroring the Warby Parker model, where people can try out different eyeglasses within the comfort of their own home. By shipping samples of the homeowner’s preferred shingle or siding, we can really bring the project to life before the work starts. The homeowner can see and feel the materials, and review the selection once more together with one of our professionals if they wish.” At this point, the salesperson also presents a precise quote based on HOVER’s measurements. If the homeowner has any questions about the pricing, the representative leverages HOVER to explain exactly how each line item is priced and what measurements they’re based on. Even after the deal is closed, the sales rep stays in touch with the homeowner to champion their best interest throughout the production and installation process. The homeowner also receives access to Endeavor’s project management tool where they can find all documentation and real-time updates about the project. Endeavor Exteriors provides a lot of flexibility in their sales process to communicate with the homeowner in the way that works best for them. Homeowners can either opt to immerse themselves with Endeavor’s digital experience and take photos of their home themselves. Or, they can follow the more traditional route where a salesperson visits the homeowners’ house and takes the photos for them. “What differentiates us from other contractors is that homeowners can work and communicate with us in the way they prefer: either fully digitally or in-person. If they are too busy to meet us in-person, we invite them to download HOVER through HOVER Connect. If they prefer for us to capture photos of their property, we’re happy to do so either when the homeowner is or isn’t at home. In doing so, we accommodate each individual’s lifestyle and personal preferences,” says Chris. Besides closing bigger deals, Endeavor Exteriors has also seen an increase in its number of positive online reviews. “Homeowners are delighted by the fact that the end result of our work looks exactly like what they expected. We’re happy to see that this has led to more glowing online reviews for our business,” conveys Chris. Thanks to HOVER’s accurate measurements, Endeavor Exteriors has been able to provide detailed quotes to the homeowner faster than any competitor. In combination with the 3D model, this has allowed them to close deals much quicker. On top of that, they have also been able to speed up the production process as they now have all measurements they need at their fingertips. “The time from when the lead comes in until we can start installing a project has shrunk drastically. Overall, HOVER has allowed us to speed up our sales and production turnaround time as everyone is aligned and has access to all information they need,” testifies Jonathan. Endeavor Exteriors is an innovative roofing company serving the Denver metro area. The company specializes in residential and commercial roof repairs and replacements. Endeavor Exterior’s mission is to bring a fresh feel to the exterior remodeling industry by bringing modern methods, technologies, first-quality craftsmanship and expert service to all customers.